In a very digital world, our first impressions of people typically come from email or social media interactions instead of face to face. Even though these circumstances are different, I really feel you can read personalities and demeanor the same way. When you stumble upon a genuine person, you know it immediately, like my kind, wicked smart, and beautiful friend Sarah of Snixy Kitchen. We met through blogging last year she solved a tech problem that was giving me fits, and soon after I got lost in her blog – beautiful story-telling and photography that will make your mouth water. Later we bonded over cats and good food, and soon a friendship formed. To bring things to life, I flew out to California to visit, just knowing it would feel like we’d been friends for years. And it did. We had the best time together, shooting recipes, going to the Cat Cafe, spatchcocking a chicken at Alanna’s house, and scouring the city for food props. Just as I knew Sarah would be a friend I could count on no matter the number of miles between us, I know that she is going to be the most amazing mother to her #cheesebabygirl due in just a few weeks – which is why a group of blogger friends are throwing her a surprise virtual baby shower today! 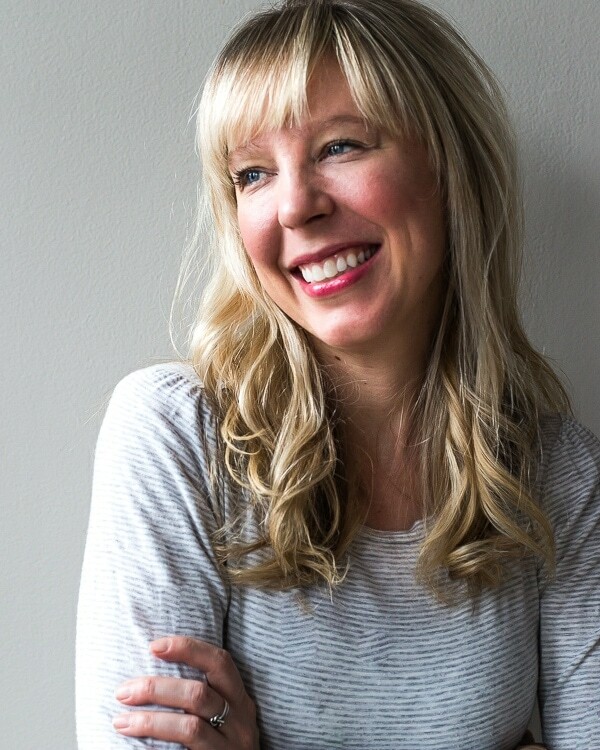 Sarah is known for her love of cheese and has had a fierce craving while pregnant, so much so that she’s been referring to her bun in the oven as #cheesebabygirl. She loves sweets too, (must make her bacon fat gingersnaps), so with those things in mind, we all came up with a delicious dish to share. 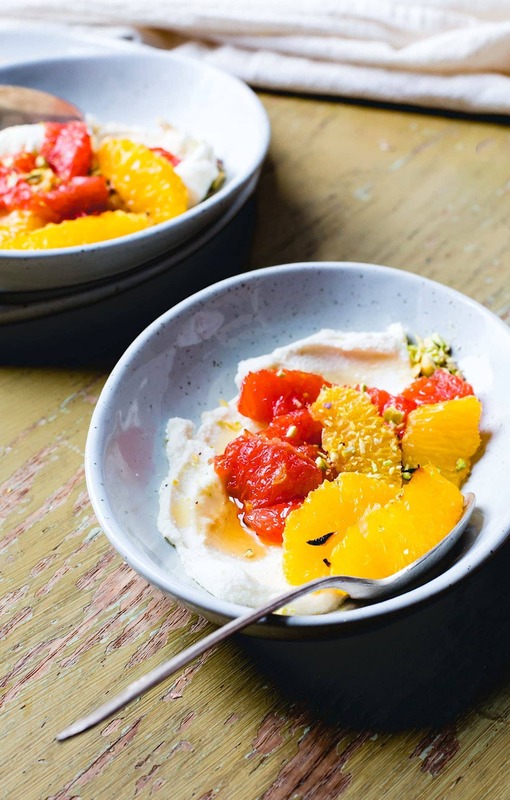 These Roasted Citrus Bowls were inspired by all the pretties that are in season, with vibrant colors and juicy tartness, a refreshing palate awakener in the doldrums of winter. My first thought was to cut the grapefruit in half and brûlée (another word for broiling) it like this, then top it with honey swirled mascarpone. But when I want to eat my dessert, I want those citrus segments to be at the ready instead of having to dig out each piece and fight with the membrane. This quick roasting method is quite simple. 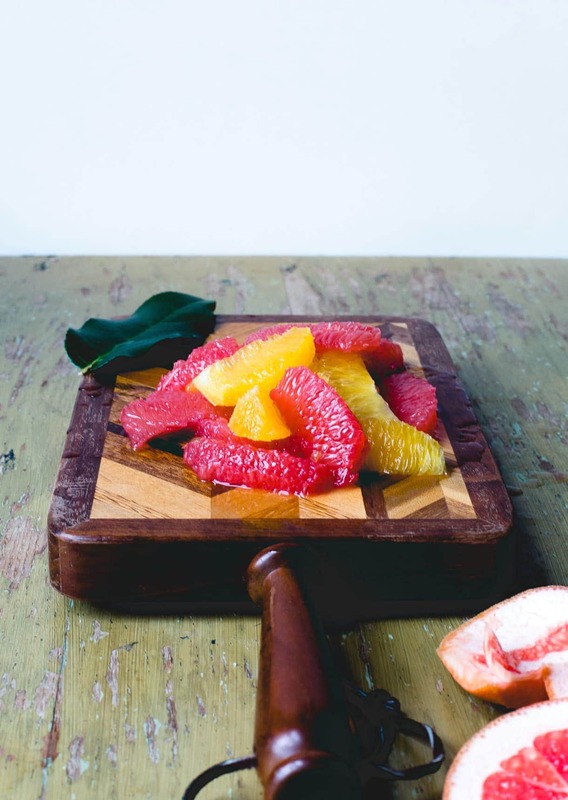 You’ll still get lovely caramelization, by segmenting the grapefruit and oranges (here’s a tutorial in case it’s your first time), and the heat brings out their natural sweetness. 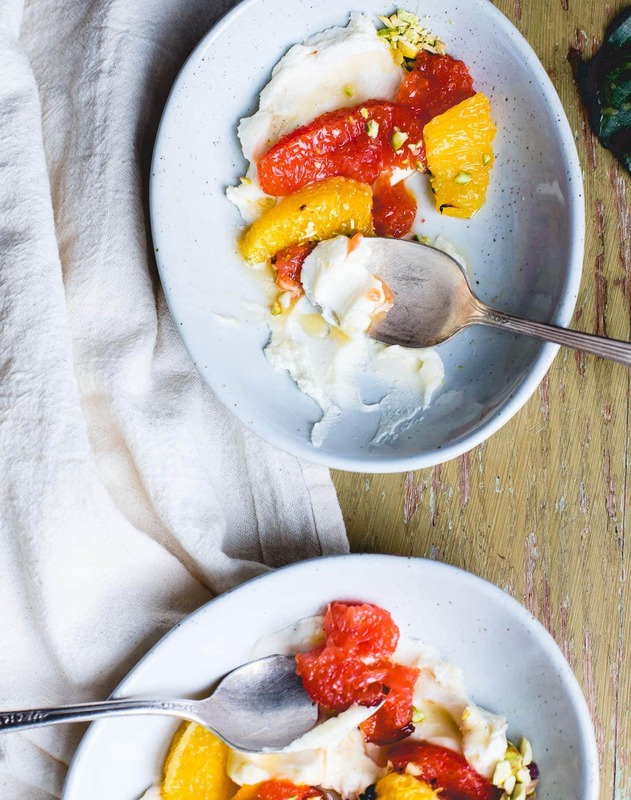 Meanwhile you’ll stir the honey and a bit of crushed cardamom into the mascarpone, and when the citrus is done, you’re ready to build these beautiful bowls. There’s a lot of delight in the luscious pile of fruit atop that creamy cradle, infused with the soft notes of cardamom and honey. 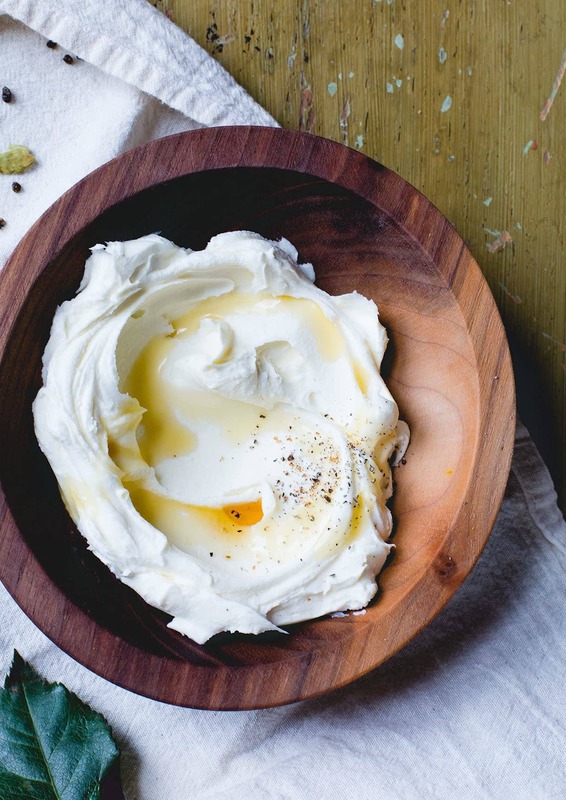 Think of the mascarpone as a richer, decadent greek yogurt – a lightly sweet italian cheese that I realized I should be eating more often. I topped the bowls with crushed pistachios for a little crunch, but any nut would do. This is one of those desserts (or brunch treats) that is so effortlessly elegant, especially when entertaining because everything can be made two days ahead, then assemble as needed. I wish I could share it with Sarah and all these lovely bloggers in person, but alas, we’re sharing the love for #cheesebabygirl all over of the internet. At the bottom of the post you’ll find links to everyone’s recipes, and I can assure you that you’re going to find several new blogs to follow. And if you want to send your warm wishes to Sarah, you can leave her a message on instagram! 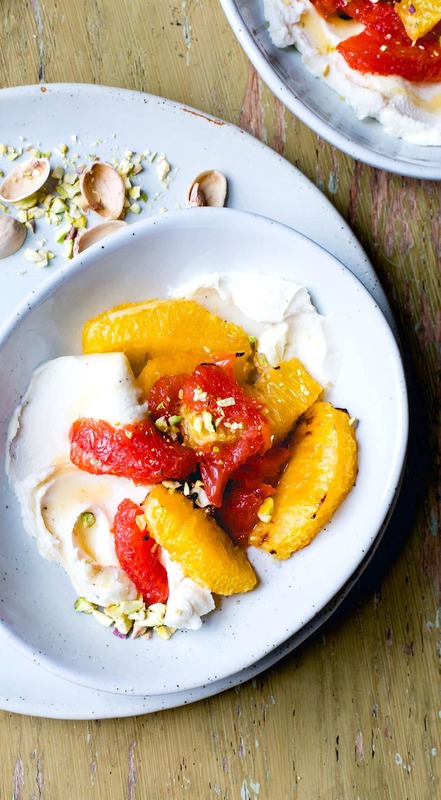 You can roast the fruit two days ahead of time, as well as the mascarpone. Just keep them separate, then assemble when ready to serve. Preheat oven to 400 degrees. Toss the citrus segments with olive oil and salt, then lay on a parchment covered baking sheet and roast for 5 minutes, then broil for 2 minutes. Meanwhile, stir together mascarpone, cardamom, and as much honey as you'd like depending how sweet you like things. Start out with 1 tablespoon and go from there. Remove citrus from oven, let cool for 5 minutes, then divide between four bowls with the mascarpone. 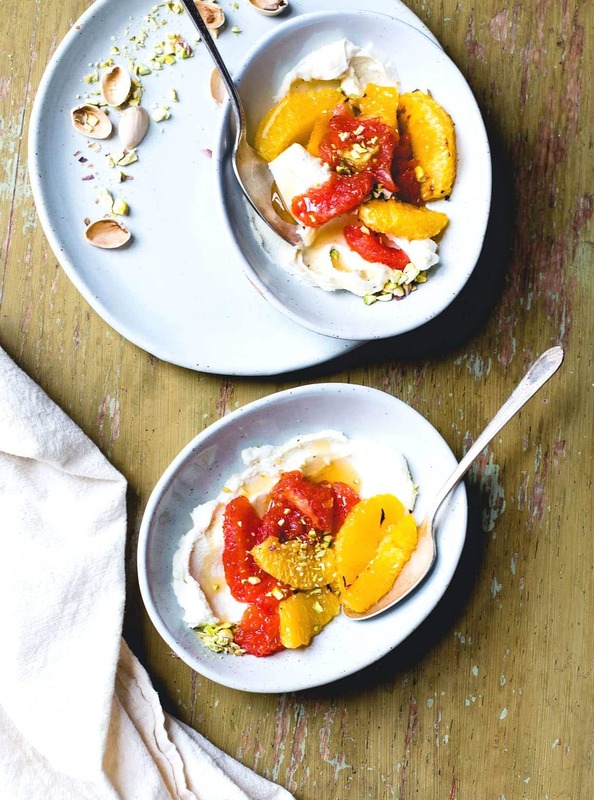 Top with crushed pistachios. Well isn’t this just gorgeous! Such a simple recipe that allows the ingredients to really shine. I love that. So happy we can all get together to celebrate Sarah today. She is such a gem! Cheers, friend! 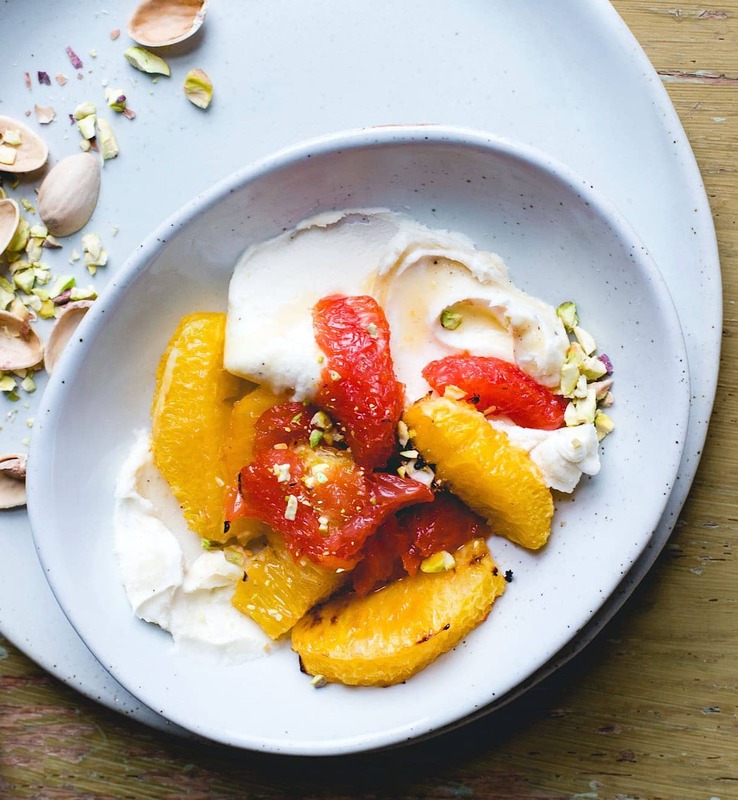 My mouth is watering just thinking about the cardamom/honey combo with that mascarpone and beautiful citrus. And these photos are so gorgeous!! I love it all, no doubt Sarah will too! xo. hi jaime! ugh, isn’t it irritating to try and dig the grapefruit out? this was my solution, and I have to say, it let me get down to dessert a little faster. :) love ya! 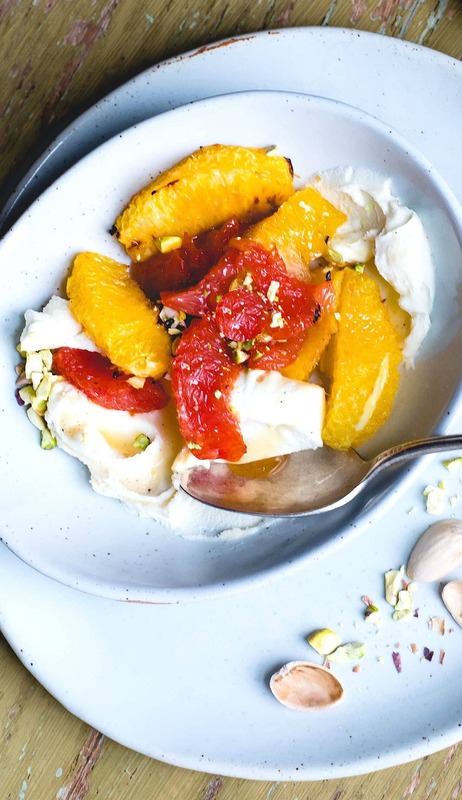 This combination sounds so perfectly simple but mouthwatering, I just love cardamom always and I can’t wait to roast some citrus when I get home tonight. I’m so happy we could come together for this virtual shower today, it is so lovely to see everyone’s posts! Just gorgeous, Amanda! I wish I had a bowl of this waiting for me right now for breakfast. I’ve actually never roasted citrus before, but it’s clearly high time I do so. Plus: Those colors!! Swoon. Oh dear – I cannot get over how elegantly STUNNING these photos are Amanda. You’ve outdone yourself with these bowls of goodness. Thank you for this delicious recipe and your loving words – I feel so lucky to call you my (real life!) friend – solidified by your trip to California (where you were so utterly patient with me as I finished up my dissertation – woooeee!). I look forward to another Amanda visit (one that includes delicious eats and cat snuggles). xoxo! They’re all true words my friend! So excited for what’s to come for you. And yes, a visit out there is sure to be needed. I must squeeze those #cheesebabygirl cheeks! literally just going on and on to my roommate about how you’ve become such an excellent photographer. your color & styling choices here are so on point. love this recipe too! such a great flavor contrast. you are the sweetest. that means SO much to me Renee. you have been an inspiration since the day i spotted one of your pictures more than a year ago. — now maybe these can be the dessert to those zucchini parm noodles you made?! This is such a sweet gesture! This sounds amazing- my favourite breakfasts are the ones that can double as dessert ;) Can’t wait to check out everyone else’s posts too!! I need to try roasting citrus! How have I never done this before?! And I can just imagine how it pairs with that creamy mascarpone with the hint of cardamom. :) Such a beautiful way to make the most of what’s in season! I loved reading about how you formed your friendship through your blogs. It’s something I just started to realize is possible and am feeling so blessed by all of the great inspirations and encouragers out there. You are one of them! Yes, totally possible Emily – and I’m glad it’s brought us together! Hopefully we’ll meet in person – sooner rather than later, xo. I have about 7 pounds of citrus in my kitchen waiting for a recipe like this. 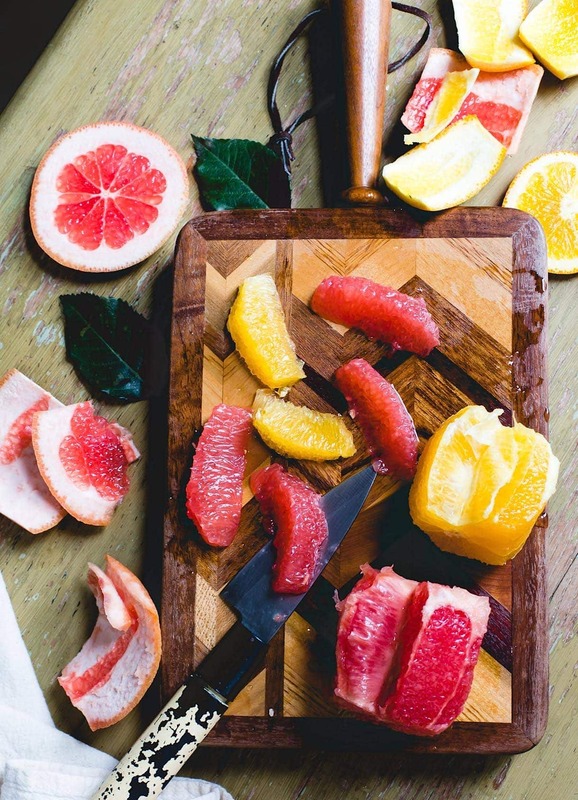 I love how the colors of the grapefruit and orange compliment each other so well. Such a beautiful treat for Sarah’s baby shower!